The first order by National Green Tribunal in hydropower projects has finally come and held the GVK company responsible. The verdict proved that rapid dam construction is the major reason for 2013 disaster. The story behind the conflict at Srinagar hydro plant is one of communities, spiritual devotees, powerful goddess, courageous activists and incredible coincidences. The hydroelectric plant is located on the river Alaknanda, one of the affluents of the sacred Ganga river, in the state of Uttarakhand (hereafter UK). It is operational since March 2014. It is run by the company GVK through its subsidiary Alaknanda Hydro Power Company Limited (AHPCL), and has benefitted from CDM funds. The hydel plant has been developed as a run of the river project. According to the Power Purchase Agreement, 88% of the energy generated will be purchased by the Uttar Pradesh Power Corporation Limited while the remaining 12% will be given free of cost to Uttarakhand state. 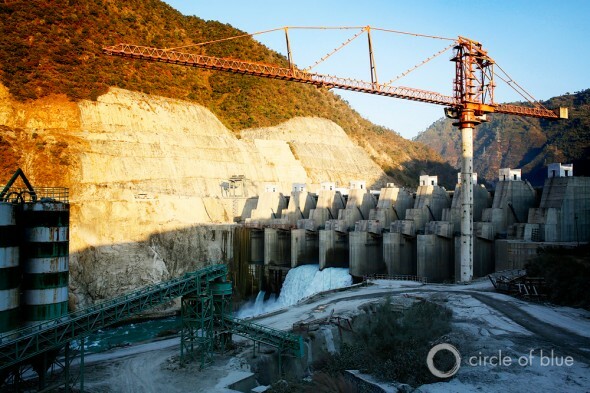 The state government has been pushing for hydropower development for many decades now, both in the public and in the private sector while a few of them are also funded by the Asian Development Bank and CDMs. The organization SANDRP counts on the Alaknanda river and its tributaries alone 37 hydroelectric dams in operation or under construction. The whole state of Uttarakhand has 98 operating hydropower projects (of all sizes) with combined capacity close to 3600 MW. Out of this capacity, about 1800 MW are in the central sector and 503 MW in the private sector . But plans are likely to expand rapidly. The state is aiming at a total of 336 hydropower projects with total capacity of more than 27,000 MW. The bulk (122) of such projects are in the Alaknanda basin, while the largest capacity is proposed to be in the Sharda basin. As with many other hydel projects in the region, the plant has sparked opposition from the local inhabitants since its inception. Activists argue that the terrain is not fit for construction of such a huge structure. Some also point out that a medical college was proposed to be built in the same place, but the plan was scrapped due to the nature of the land . Risks of flood, water leakages and unstable terrain jeopardize entire towns, villages, fields, forests. The dam’s capacity has increased from 200 MW (from an initial phase) to 330 MW without any thought and concern for the environment and geomorphology of the place, according to the mobilized organizations such as Matu Jan Sangathan. Local EJOs also recall how mishaps are not new at the project site. In 2008, 2009 and 2010, and again in 2014 the coffer dam (which is a structure constructed just below a diversion structure of a canal to remove bed sand, and silt loads) broke, and debris submerged houses and fields. During the Uttarakhand floods on June 16-17 2013, the reservoir of the Srinagar Hydroelectric Project was filled due to heavy rainfall. The dam authority, AHCL, kept the gates closed which led to accumulation of water. Only when the water was far above the limit, AHCL opened the dam gates without informing or sounding any alert to the localities downstream. The massive flow of water swept away the muck that was dumped in the river bed by the dam authorities and damaged the villages and houses downstream. In an interview given to Down to Earth, Vimal Bhai of Matu Jan Sangathan said: "“Even after six months since the June calamity, there has been no inquiry by the state or Central government. We have been trying to file an FIR but local district police officials have always refused to do so. It is very much clear that politicians are supporting dams, not the welfare of people, and are pursuing their own personal interest,” . Activists argue that all the run of the river projects involve the building of a dam, diversion structures, desilting mechanisms, tunnels, roads, townships, mining, among other components. These additional activities and infrastructures have made the soil even more instable and provoked hydrogeological disturbances and land slides. Therefore, they are among the major causes of floods and disasters such as the one in June 2013 . As of Sept 2014, the company is still in the process of repairing the cracks caused by the previous year's floods as well as more recent ones. It has not able to generate any power since the flooding. At the Srinagar Hydro Electric Project, the matter is further complicated due to the sacredness of the Dhari Devi temple, located on the river's bank. As it was going to be submerged, AHPCL had been trying to relocate the Dhari Devi temple which would allow enhancing the hydro-electric project’s capacity from 200 MW to 330 MW. The Ministry of Environment and Forest submitted an affidavit in the Supreme Court in May 2014 stating that the Dhari Devi temple is of “tremendous religious, emotional and cultural significance for people all over the country…several religious leaders have undertaken fast unto death on the score and several have announced that they will commit jal samadhi (death by drowning self)”. It also mentions that BJP leader Uma Bharati also visited the site several times and announced she will take jal samadhi if the temple was disturbed. The affidavit pointed out that in the recent case of Orissa Mining Corporation (the better known "Vedanta case"), MoEF had put forward similar arguments regarding the rights of the local tribal people to worship the Niyamgiri hill and the Supreme Court had ruled that the right to worship must be respected. However, the bench replied saying that as the deity at Srinagar has been uplifted on a platform upon the river's water but is still attached to the sacred rock, "none of the rights of the devotees of Dhari Devi Temple hasve been affected by raising the level of the temple". They also added that: “The Dhari Devi temple is not included in the protected monuments of Archaelogical Survey of India and it is a local temple to be worshipped by nearby villagers only. All the local villagers and the priest of the temple are in agreement with the project authorities to raise the temple”. Be it as it is, on June 16th 2013, Dhari Devi, the goddess of power, was placed on the new platform. On the same day, in a cruel twist of irony, the cloudburst opened on the Himalayan ridges above the Alaknanda and Mandakini rivers, setting off the calamitous flood. The project, which is 248 metres long, is 90 m high (from deepest foundation level) dam. It utilizes the net head of around 66 m between the diversion dam and the power house to generate electricity. The water conductor system consists of two head race tunnels, RCC troughs, power channel and penstocks. The Power House accommodates four vertical turbines rated at 82.5 MW each. The water released from turbines will flow into river Alaknanda through a tail race channel. As a project registered under the CDM, it says to contribute to reduce 1,204,120 metric tonnes CO2 equivalent per annum. Defence of sacredness of the temple, threatened "death by drowing"
Development of Alternatives Small scale projects run by communities for their own needs. Why? Explain briefly. Although the Supreme Court and High Court have not ruled in favour of activits' argumentations, MoEF has expressed important concerns and perplexities. However, communities cannot be paid back what they lost in the heavy floods, nor compensated for the victims in their families. EJ can only be served if such projects are scrapped and size and purpose rediscussed with local communities for an integrated plan on the territory for energy generation and transmission. SANDRP: How do they add to the disaster potential in Uttarakhand? EJOLT blog - Himalayan Dams: goddamned! GVK Company held responsible for June 2013 Disaster, fine rupees 9 crore. On 19th august National Green Tribunal (NGT) after 18 hearings gave a historic verdict on the petition filed in august 2013 by Srinagar Bandh Aapda Sangharsh Samiti and Matu Jansangathan for the compensation against the destruction and damage caused during 2013 disaster because of srinagar dam constructed over Alaknanda river by GVK company Uttrakhand. Hon’ble Justice U.D Salvi, judicial member and Hon’ble Prof. A.R. Yousuf , expert member held GVK company responsible for 2013 disaster and ordered to compensate the affected people with rupees 9,26,42,795 Rs. and 1 lakh per petitionor. Srinagar Bandh Aapda Sangharsh Samiti and Matu Jansangathan welcomes NGT’s pro people order. This verdict proved that rapid dam construction is the major reason for 2013 disaster. Matu Jansangathan raised voice on the role of dams in 2013 disaster at every level including parliament, legislation and famous politicians but unfortunately nobody uttered a word. Now after NGT’s order political parties will control such dam companies who abuses people’s right. This is ever first order by NGT in the Hydro Power Projects. It will give a new way to the Hydro Power Project affected people. 1. Respondent no.1- Alaknanda Hydro Power Co. Ltd. shall deposit an amount of Rs 26,42,795/- by way of compensation to the victims of the June, 2013 floods in city of Srinagar with the Environmental Relief Fund Authority established under Section 7 (a) of Public Liability Insurance Act, 1991 within a period of 30 days from the date of this order. 2. Amount of Court fee payable i.e. 1% of the amount of compensation awarded shall be deducted from the said deposited amount and remitted to the Registrar, National Green Tribunal as per Rule 12 of the National Green Tribunal (Practise and Procedure) Rules, 2011. 3. The respondent no. 3- State of Uttarakhand shall issue necessary directions to the District Magistrate of District Pauri to depute any senior Sub-Divisional Magistrate to call for the claims from the persons as per list annexed as annexure A-5 with necessary proof in support of their claims. The SDM so deputed shall verify the claims made in light of the proofs produced and remit the amount due to such person/s after deduction therefrom the proportionate 1% amount of Court fees payable as per list annexure A-5 on finding the claim to be meritorious. Claims shall be called by publishing a notice, therefor in the office of the District Collector, Srinagar Municipal Corporation and on the website of the State of Uttarakhand. No Claim filed after 90 days of publication of such notice shall be entertained by the District Magistrate. Balance amount remaining in environment relief fund after disbursement of the amount as aforesaid shall be utilised for taking such measures for restoration of the public property affected by the floods. 4. Respondent no.1 shall pay an amount of Rs. 1 lakh each to the applicants as well as the respondent no. 4 as and by way of cost. 5. Original Application no. 3 of 2014 thus stands disposed of. The tribunal in its 42 pages order has briefly explained that GVK company has regularly violated the environmental norms which has resulted in flood and devastation of muck. Various reports have also pointed out that walls protecting muck should be built , also plantation and wire fencing should be done around the muck. The muck though put around the river way back but still no plantation has been carried out yet. Tribunal also went through the Ravi Chopra Committee’s report which was constituted by MOEFCC under the dircetion of Hon’ble Supreme Court of india , the committee has also inspected the area. The tribunal also denied to accept the arguments put forwarded by Dam company that the area comes under flood affected area. Since the State Government has not defined a flood area, therefore what happened in the area was a natural calamity. Putting forward his argument, the Uttarakhand State public prosecutor first tried to prove that the matter should not be taken into cognizance of court because what happened was a "Act of God" and not negligence on the part of state government or GVK company. The tribunal in its para 19 of the order has said that state government has not been able to deny the argument which held responsible the GVK company for disaster. We are highly obliged to our advocates, Ritwik Dutta and Rahul Chaudhary who took up this case without charging any fee. We are also grateful to Dr. Bharat Jhunjhunwala , the plaintiff who provided all facts pertaining to environmental conditions violated by GVK company to the tribunal. ---According to order issued by NGT, Uttrakhand state government authority to instruct District Magistrate of Pouri district that the issue of allocation of compensation should be done without corruption. ---When it was proved that GVK Company is responsible for the flood in a particular area of Srinagar then the administration should also take appropriate action and initiate criminal proceedings against it. The GVK Company should be penalized for the offenses committed knowingly to make them alert in the future. As the judiciary performed its duty likewise the state administration should also take the same route to ensure justice to the people affected. Prem Ballabh Kala, Vijaylaxmi Ratudi, Chandramohan Bhatt, Nirmala Noutiyal, Vimal Bhai.